A large apartment next to the beach and the entrance of the harbour. Spacious apartment on the ground floor with a superb view on the entrance of the harbour and Saint Tropez close to the beach of Port Grimaud 1. A large living-room with seaview, a little kitchen, guest toilets, a bedroomwith two single beds gathered on the sea side, a second bedroom with two single beds and its own shower-room on the place side and a separate shower-room. 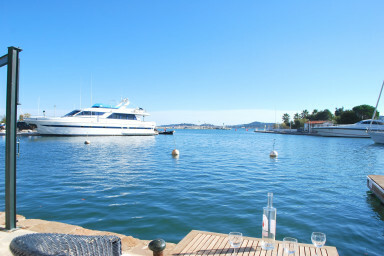 On the sea side, a wide terrace will allow you to relax while admiring the view on Saint Tropez and the boats entering the harbour. Face to the terrace, a 12m x 3,60m berth to moor your boat.